Doggone it, I like this cover. It’s water-themed like many of the new photo covers. It has the iconic solitary man … uh … person. It’s beautifully composed and lit. It has an under-dressed girl. So why does it annoy me so much? Firstly, who is riding the motorcycle? It can’t be Lysa Dean because (SPOILER ALERT!) she never rides a motorcycle in the story. If it’s Dirty Bob, well, he does lose a hundred pounds during the story and sure looks good in that bikini, but if that’s him I can’t see how he was able to give ole Trav such a hard time in a fist fight. Secondly, that hilly shoreline is nowhere in Florida where I’ve ever been, and I’ve been to every county in Florida, so it must be California, where Dirty Bob lived. Maybe he took the photo and girl is his niece. Yeah. Thirdly, aw c’mon guys, does nobody notice this stuff but me? The license plate on the motorcycle is clearly a European Union plate, probably from Germany. Have you seen me? 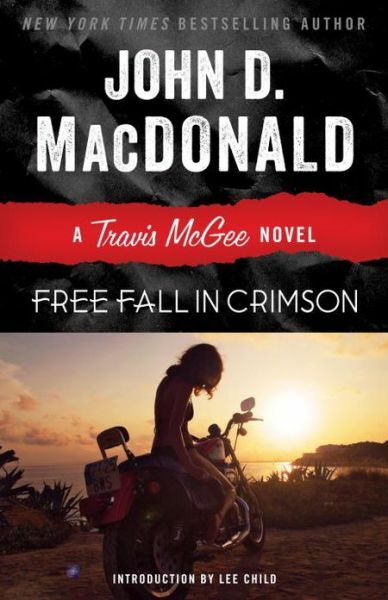 I am a US hardcover edition of Free Fall in Crimson, printed in 1997 by Random House under their Value Publishing imprint (ISBN-10 0517199106, ISBN-13 9780517199107). Come to think of it, has anybody ever seen any Value Publishing cover? I never have. I’m beginning to wonder if they really exist. I like this one. It’s minimalist, for sure, but the solitary figure captures the sour mood that Travis is going through at this time and the ripples make it hard to see what lies ahead. The water is a common theme in this set of photo covers, and why not? Ole McGee is a waterman, after all, and this water is close enough to green to qualify as a true Color Cover. And you know I like shadows and reflections. My first thought was that we are looking into a swimming pool, but now I doubt it. I think we’re standing on a dock looking down into shallow water with a sandy bottom. The shaded area is the shadow of the dock; there is no glare because it’s in shadow, see? And the waves are far too large for a swimming pool. Another in the new Travis McGee cover series. I’ve complained before when a McGee cover fails to pick up on the color theme, but there can be no whining here. That is the copperyest sea (and sky) I have ever seen, although it is not exactly empty, well the sky is but not the sea, you know what I mean. I guess it’s meant to show loneliness instead of emptiness; you and I know they are not the same but how is some schlunky photographer supposed to know? What I really like about this cover is the sheer oiliness of the water. How did the photographer capture that? Have you seen me? 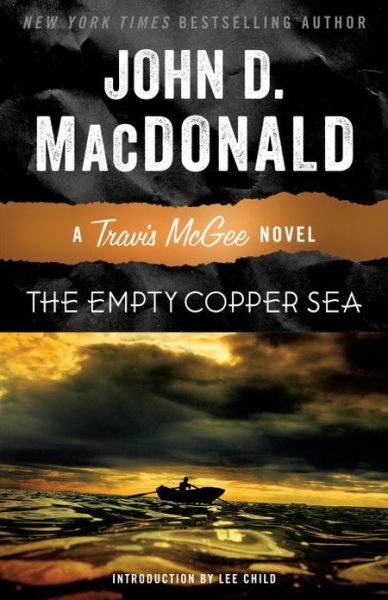 I am a UK hardcover edition of The Empty Copper Sea, printed in 1991 by Book Club Associates. 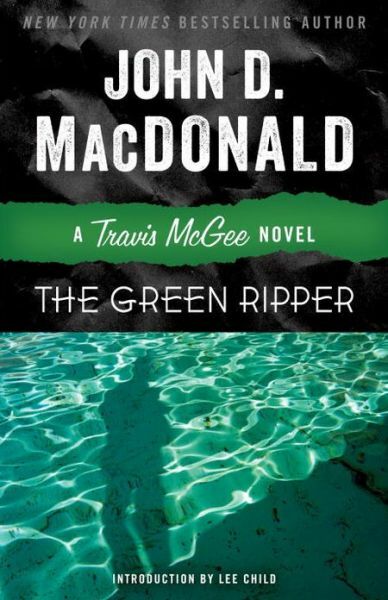 It has come to my attention that I never finished posting the new Travis McGee covers. The final one — Silver, of course — was released in November so I’m a bit behind. If you ever lived in Florida, you would recognize the motel sign. Not that particular one, but ones like it. Back in the 1950’s, a motel in Florida meant a tourist court, which is a one-story building with ten or twenty rooms built in a U around a central parking area. Many of them are still there although no tourists — at least no tourists that I know — stay in them anymore. Drug dealers rent them by the day and transients rent them by the week and down-on-their-luck locals rent them by the month and they mostly have neon signs and all have quaint names because it costs too much to buy a new sign. I remember the Bambi, the Snow White, the Sans Couci, and the Buffalo. They are overgrown, rundown and have user-changeable signs that are usually missing letters or employ bad spacing like the one on this cover. I guess this is supposed to be the unnamed motel that was attached to the Westway Harbor Marina in Bayside that Travis and Meyer used to moor the Flush. Unfortunately, the whole marina was just two years old so the whole tourist court thing doesn’t really make sense, but I’ll suspend a little disbelief today because it reminds me of my teenage years. Have you seen me? 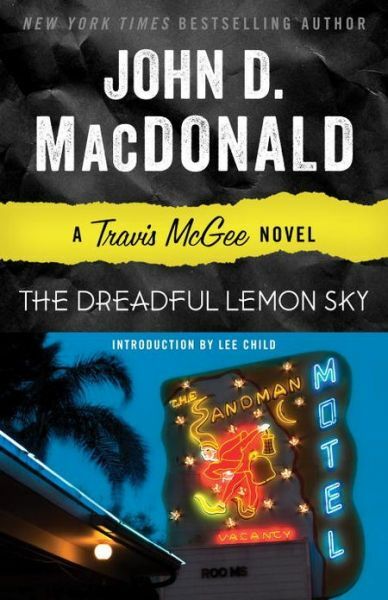 I am the 10th US paperback printing of The Dreadful Lemon Sky, printed in 1980 by Fawcett under their Gold Medal imprint (ISBN-10 0449141489, ISBN-13 9780449141489). My cover price is $2.25 and I have the iconic Robert McGinnis artwork. 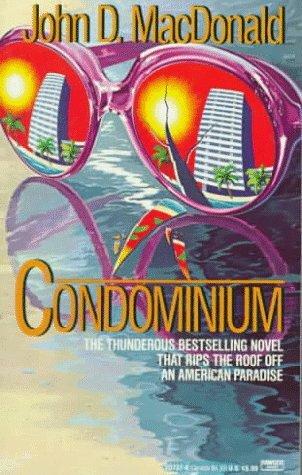 I just finished re-reading Condominium (not today’s cover, this one). It’s been a long, long time since I last read it and I wasn’t sure how it would hold up. I remembered liking it but didn’t remember why. The good news is that I did enjoy it this time around and now I know why. 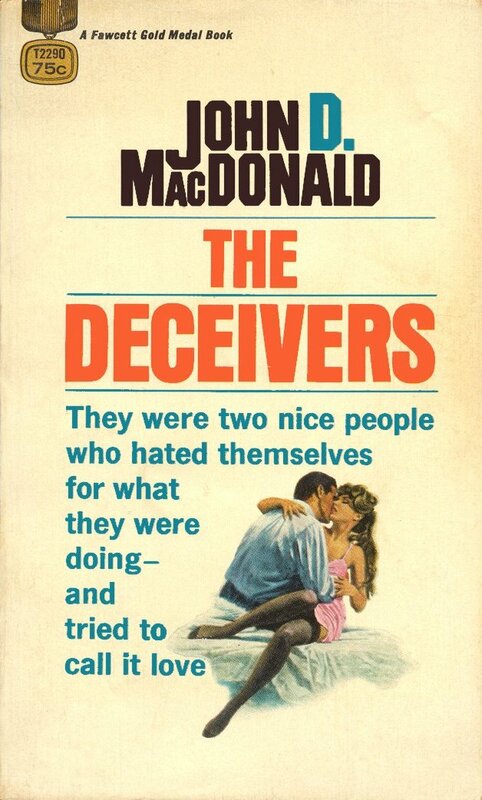 Although the novel is supposedly a disaster story of a hurricane striking a condominium, to me that is just an excuse for John D MacDonald to do what he does best: create character after character after character, each with a detailed and well-thought out back story. And that’s exactly what he does for two-thirds of the book. Many of the characters are JDM staples: the officious, arrogant petty tyrant, the call girl who thinks she is living the good life, the ruthless land speculator, the vacuous housewife, the dishonest official, the psychotic, and the earnest engineer (the only likable character in the whole book). Frankly, I liked this part better than the actual hurricane. A review by Jared complains that the hurricane is telegraphed too soon, although I saw no reference to it until page 288. He also feels that MacDonald’s Murder in the Wind, also a hurricane story, had better characterization despite being much shorter. I won’t argue that (mostly because I agree! ), but Condo is supposed to be a sweeping, gigantic disaster story while Wind was, imho, intended to be a character piece with the disaster used as a setting. Even though Wind did it better, I still liked this aspect of Condo. The book clearly states that the condo is seven stories high. Why does the cover show it being sixteen? Aw, Jeez, did I really screw up and post #521 before #520? Yep, I did. My life is over. 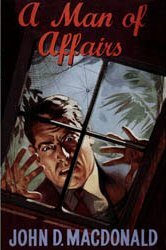 Reader Milton Bagby mentioned that he owns this cover and wondered who painted it because unlike this McGinnis cover, this one actually depicts action from the story. Sorry to tell you, Milton, that this bad boy was also painted by McGinnis. Honestly, I have never felt like it comes up to McG’s usual standards but on the positive side, it is certainly steamier and you did get me to post this cover! This art was used for four different editions but this one is the 5th printing. Every time I dial up a Robert Hale JDM, it’s a good day. It’s like reading science fiction by Arthur C. Clarke. There are SF authors that have written more (Asimov), did more to elevate SF to an accepted genre (Heinlein), and have more solid science (Niven), but Clarke still wrote a lot, did elevate SF, and did have solid science. Best of all, he never wrote a bad story, something I can’t say about any of the others (*coughasimovcough*). And here’s another great Hale cover. Despite having just finished the story not long ago, I can’t figure out what the man is looking at, but who cares? Look at his expression. Look at those hands. Look at the palm fronds waving in the wind. And the spider web just tops it off. Why does this cover remind me of Murder in the Wind? Oh, yeah. Jared has of review of the book here.